Holds up to 3 pairs of skis with poles! This lightweight molded plastic rack is a great way to store your skis. 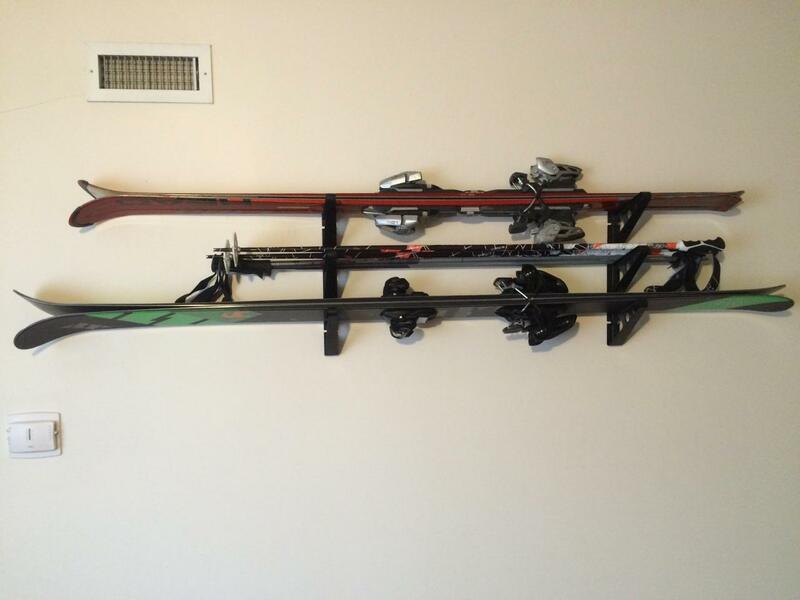 This horizontal ski storage wall rack is very durable and can easily take the abuse of continued use. No place to store your skis when you aren’t riding on the mountain? 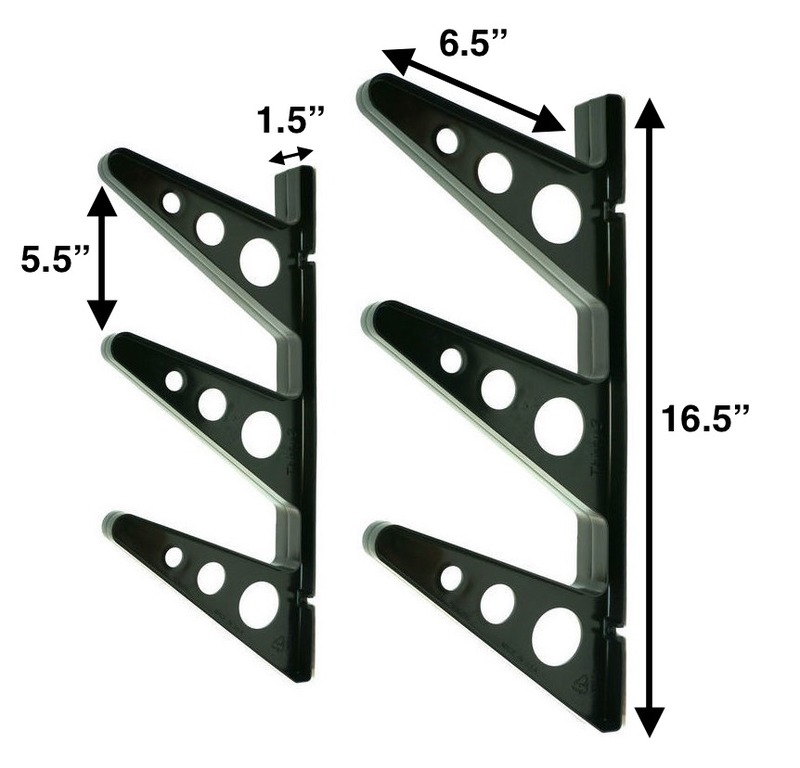 Get this wall rack! Great for displaying and storing your skis out of harm’s way. Put this rack up in the garage, a closet, mud room, or a bedroom. Comes in Black. This rack is very well engineered and is a huge seller based on simple form, great function, and one of the best price per boards stored on StoreYourBoard.com (Check it out for yourself – Price/3 (boards) and try to find a rack that can beat it!) . The design is basically an "I - beam" style, a very lightweight strong construction method used in many buildings. The rack storage surface is made with a slight angle which ensures the skateboards will not slip out and also provides a nice viewing angle. This kind of feature where the slight angle provides multiple benefits is captured all over in this rack. The area where the mounting screws affix the rack to the wall is nicely hidden and also has a thicker piece of plastic for extra support near the mounting area to make sure the screw heads don’t rip out. The design also lends itself neatly to being stacked on top of each other. It is very common for customer to order 2 or 3 of these racks and just stack them up to hold up to 9+ skateboards. This rack is made of HDPE plastic which is super strong and makes you think you could run your car over it and it would survive. With that kind of strength you know it will last for many years storing your skateboards. Another nice feature is that the plastic is very easy to paint, so if you want it to match some decor you can easily color match the rack. Not only is the rack designed well it comes with well written and diagramed instruction to make sure you mount the rack properly. There is nothing worse than getting a rack and not knowing how to install it or mounting it improperly and risking damage to your skateboards. As an added bonus this rack can hold many different types of boards from skateboards, scooters, razors, snowboards, skis, and many other things. You are sure to fill it up quick and most likely need a few to store all your gear. This rack is one of our best sellers on the entire store since it was introduced. I would say this rack is ideally suited for STORAGE of your skateboards - It is not a flashy or super stylish display rack, but if you are looking for an excellent functional skateboard storage rack at a killer price? YOU FOUND IT! Pick one....or 3 up today. 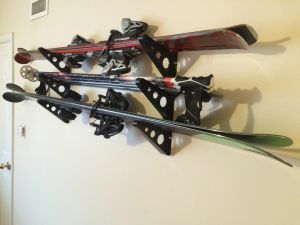 Width of base pieces that attach to the wall: 1.5"
Distance between top and bottom mounting holes on each arm: 11"
Hey, this is Josh from StoreYourBoard, here today to talk about the Ski Trifecta Rack. Here it is alone. Here it is on the wall, a couple of pair of skis in there. It’s a great, great rack to store and organize your skis, in your garage, in your home, in your basement. I usually like to use just usually two skis especially if you have kind of adult skis. You can see with the bindings, the middle becomes a little bit tight. I usually love to put the poles there, so two skis and poles works great. We sell the Trifecta Ski Rack in black, and we also have a clear version. It comes with three rungs, kind of like I said. You got 6.5 inches, so even your fast skis, powder skis, it fits fine. You can see here it’s kind of a raised pair, your kind of old mountain pair, all of them fit great, and then like I said the poles easy on the middle rung. You got that. You got three rungs. It has two different arm sets, so what’s cool is you can mount it at any distance you want, so if you have two long sets, you can mount it a little bit further, so we have these at 32 inches right now. That will be hitting studs, usually 16 inches on center studs. We do include a hardware pack that includes four screws and four drywall anchors, so if you can’t hit those studs, you can use the drywall anchors. We have it mounted up a little bit further spread. The Trifecta Rack is also great for skateboards, longboards, snowboards, hockey sticks. It’s just great to organize anything in your garage, so depending on what all you want to put on it, that really affects how far apart these two arms are. You can see here you just put your skis up and down. It’s also nice you don’t have to store your skis by the tips. A lot of the ski racks kind of squeeze the tips. Some people don’t like that. So the horizontal store is a nice alternative. I want to put this aside, show you the snowboard. 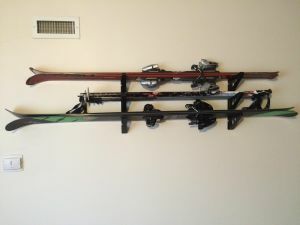 For those families who have more than one, you got a ski, you got a snowboard -- perfect winter time storage rack. Check it out. Thanks! Why are there 4 mounting hole slots in each rack side (8 total slots)? It says there are only 4 screws and drywall anchors included. The rack is manufactured with 4 mounting slots on each rack side to give you flexibility in mounting. The rack has more than enough strength to hold your typical skateboards, snowboards, skis, sticks, and many more items with just two screws on each side. Please remember this is an engineered product. It is constructed to hold the most weight in the downward direction, the way your gear will apply force to the rack. It is not as strong in the lateral (side to side) direction but it is more than sufficient. We have tested it and have seen it hold well over 50lbs of gear using only 4 mounting locations (2 on each rack side). The important thing is to make sure those 4 screws are securely grabbing something sturdy. It is best to screw the rack into solid wood studs or a wooden mounting surface. As for which holes to use, we typically recommend using the inside mounting holes so that the rack has a cleaner appearance from the outside. When your boards are stacked in the racks you can't see any of the mounting screws. perfect design for my downhill and cross country skis!! We have 2 downhilll and 6 cross country and so I bought 2 of them. Very reasonable price and easy to install. This was so simple to install and just perfect for our needs. Great service and will definitely keep this site as a favorite for other needs. The product was exactly as expected at a very fair price. Shipping was quick. I've already ordered from them 3 times and each experience was very good - they'll be a regular site for me to shop from. Nice compact rack that doesn't protrude from the wall much. Perfect for snow or water skis. Great system for holding 3 pairs of my ski touring skis and 2 downhill skis. Because of weight issues, I had to installed 4-extra screws on both ends to fasten onto the wall. 9Extra strength. Rack came with only four mounting screws- Requires 8 screws to mount properly. I purchased 2 wracks and use them for snowboard, alpine skis, skateboard, and holding a long construction level. We plan on adding XC skis once we own some. It gets our stuff off the ground and on the wall out of the way and was easy to install. The wracks are light weight but hold and secure our heavy items very well. The rack is perfect for my garage. It was easy to install. I may purchase more for off season storage in my basement. It really only holds two sets of skis because of the binding overlap as explained in the video. Perfect solution for 3 sets of skiis. Easy to install, excellent value. Great rack! We use them for our waterskis! Not much more to say. Great racks all the way around. They aren't pretty, but fine for storage in a basement or garage. Hands down the best ski rack I've owned, and it's so easy to install. 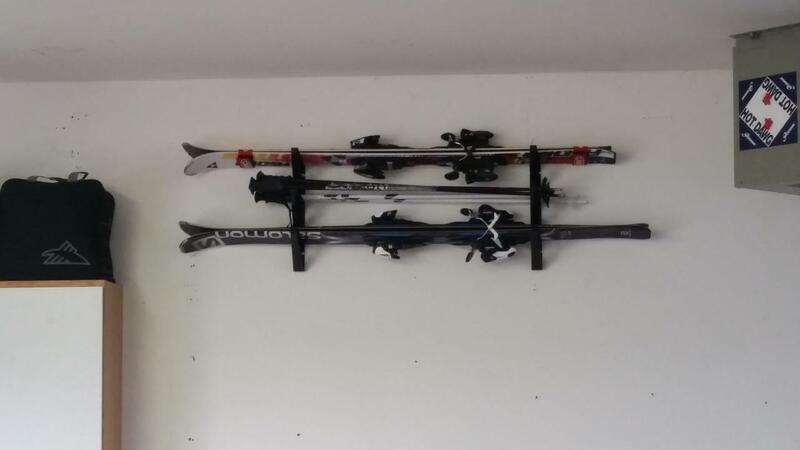 Gets your ski gear up off the ground and puts them on display. This thing's burley enough to hold my 203cm Volkl shiros. Would recommend to everyone. Did exactly what I wanted it to do. Got my snow-skis and snowboard off the floor and up out of the way. Looks nice too!. Will probably order another set for my water skis. Perfect simple rack. I have me and my husbands skis on the first two levels and our sons snowboard on the bottom. The rack does feel very solid once it is mounted on the wall. I am very happy to have the garage organized a bit more with this rack. Good product. A little tight getting 3 pairs of skis on (especially the new fatter skis) but was able to do it.